First of all , I would like to thank the people who made this awesome software. Alright,I am working with HeadUs for almost 2d days and after watching most of the video tutorials I decided to work on my Model's head. 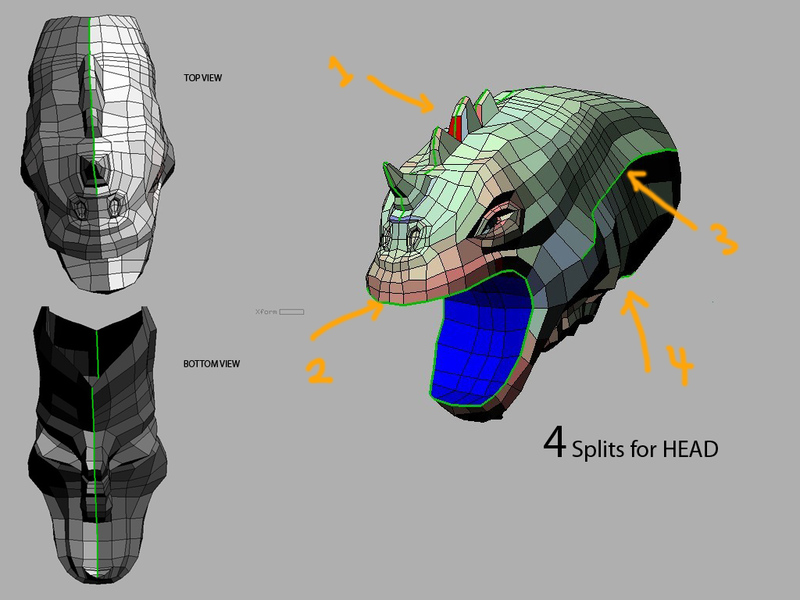 I basically cut the head in 4 areas and then separated the mouth and attached it to head after optimization on the main head area. Please let me know if my UV work flow is right and I did map it properly.Also,I am wondering why my UV map is completely white and I don't see other colors like Green,Red, and Blue anymore. "Please let me know if my UV work flow is right ..."
Looks good to me! But I'm a programmer, so don't trust me on this one. My only comment is that you can make it perfectly symmetrical if you want with the Symmetry Find tool. it can be applied to an already flattened mesh if you want. "Also,I am wondering why my UV map is completely white"
You probably did some local scaling with the 4/5 keys, and thats switched the coloring to show the local scaling only. Aim the mouse pointer at some of the background and hit 4 or 5 and it'll switch it back to error display, or open up the Display panel and click on Error next to the Color label. Thanks for the fast reply and your kind comments. You were right,I did use 5 key and I fixed it by clicking on Error.Could you please tell me briefly what green,red, and blue represent on UV.I also want to know why the uv gets completely Red when I scale it down in 0 and 1 space.Thanks again Phil. "what green,red, and blue represent"
Green is good, meaning the size of that poly in UV space is close to its size in 3D space. Red polys are smaller in UV, so the applied texture will appear stretched out, and blue polys are large and the texture will appear squashed. "why the uv gets completely Red when I scale it down"
Because you're making those polys smaller (see above). You should resize the red 0-to-1 square instead ... the "Auto Fit" button or packing is the quickest way to do that. Excellent monster head and I love your mapping.